Olongapo City Mayor Rolen Calixto Paulino faces indictment for allowing the SM Prime Holdings Inc. (SMPHI) in 2014 to lease and develop a government property. Ombudsman Conchita Carpio Morales has already ordered the filing of a graft case before the Sandiganbayan against Paulino. 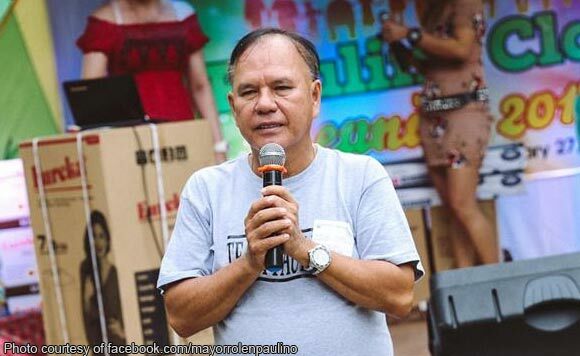 Apart from him, the Ombudsman also named as his co-accused Vice Mayor Aquilino Cortez Jr.; and former Councilors Elena Dabu, Benjamin Gregorio Cajudo II, Eduardo Guerrero, Noel Atienza, Alruela Bundang-Ortiz, Edna Elane, Emerito Linus Bacay, Randy Sionzon, and Egmidio Gonzales Jr.
Other government officials named as accused are Tony-Kar Balde III, Cristiflor Buduhan, Anna Marin, Florentino Sison, Mamerto Malabute, and Joy Fernandez Cahilig. Records show that SMPHI was granted in 2014 a long-term lease of the Olongapo City Civic Center (KGB Complex) which it intends to develop with the construction of various buildings including a mall, hotel, and transport terminal. However, the Ombudsman discovered irregularities in the granting the lease to SMPHI which secured the contract on November 12, 2014. “They acted with manifest partiality, evident bad faith or gross negligence by failing to follow the prescribed period under the law with the clear intent to deny other prospective project proponents of making a better offer or proposal, and as a result, their act gave unwarranted benefit advantage, preference or benefit to SMPHI,” ruled the Ombudsman. It cited that defendants failed to follow the 60-day prescribed period from the publication of invitations to bid to awarding of the lease contract. Also, the Special Bids and Awards Committee (SBAC) was discovered to have a notice of award on October 30, 2014 which was just 10 days after the last invitation to submit bids was published. Tags: Alruela Bundang-Ortiz, Anna Marin, Benjamin Gregorio Cajudo II, Cristiflor Buduhan, Edna Elane, Eduardo Guerrero, Egmidio Gonzales Jr., Elena Dabu, Emerito Linus Bacay, Florentino Sison, Joy Fernandez Cahilig, Mamerto Malabute, Mayor Rolen Calixto Paulino, Noel Atienza, Olongapo City., Ombudsman Conchita Carpio Morales, Randy Sionzon, Sandiganbayan, SM Prime Holdings Inc., Tony-Kar Balde III, Vice Mayor Aquilino Cortez Jr.